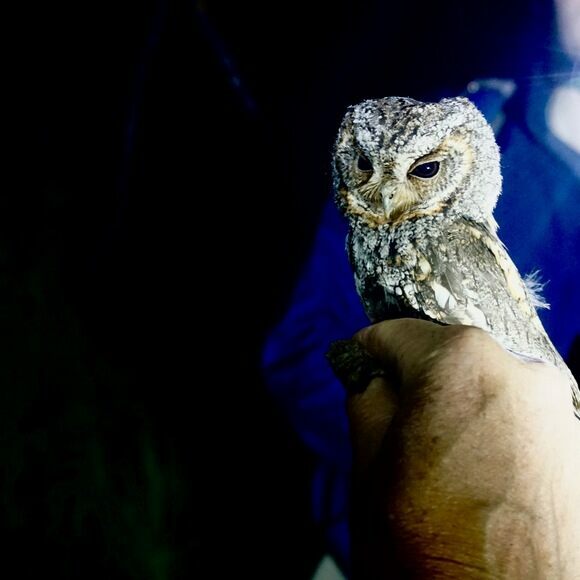 As darkness falls, hike into the forests of the Wasatch Mountains, ears perked for the low-pitched “boop” of the Flammulated Owl—a pocket-sized insectivore less than six inches tall with dark, searching eyes. 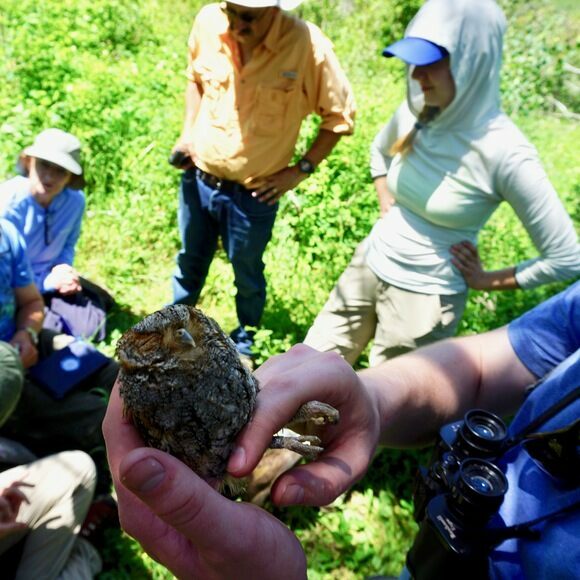 Led by an expert avian biologist, you'll experience one of the most secretive owl species in North America. 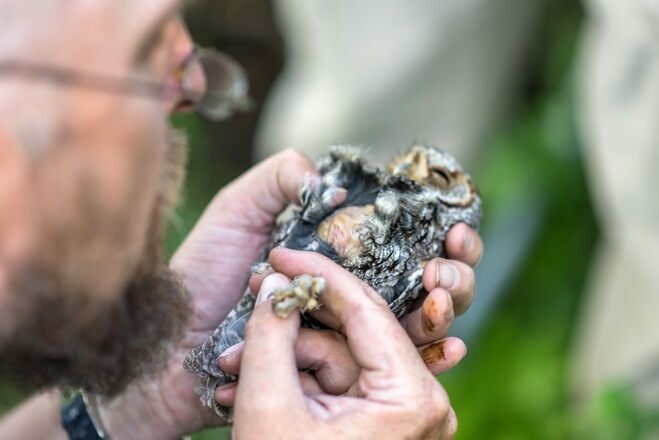 At four different study locations near our home base in Ogden, Utah, we’ll be helping researchers find active Flammulated Owl nest sites, measure and band female birds, estimate insect prey abundance, and follow the calls of territorial males competing over food and forest resources. We may also be lucky enough to encounter other small owl species such as the Northern Saw-whet Owl, as well as northern flying squirrels. Efforts at tracking nesting owl pairs and their offspring help scientists understand resource needs in an ever-changing environment and shifting climate, and the information we gather during our four days together will add important data to the longterm study of this population. 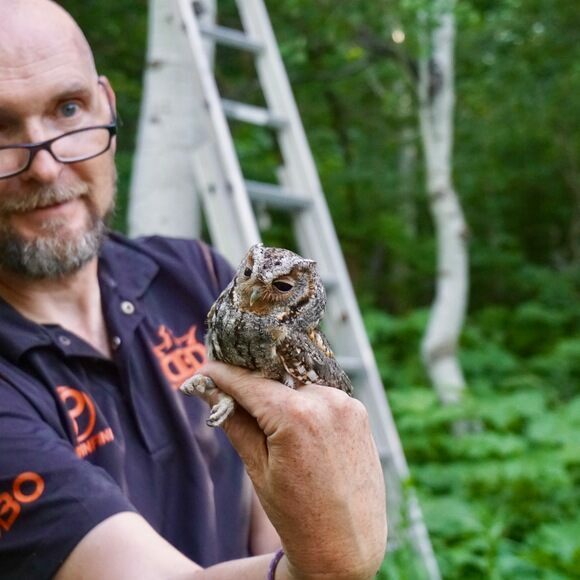 Arrive and meet Markus Mika, your group leader and owl expert, either at the Salt Lake City Airport or at our home base in Ogden, Utah. We’ll be departing the airport for Ogden at 4:30 p.m. in our group's private vehicle (45-minute drive). We’ll take some time to settle into our spacious house for the next four nights, then start getting to know our companions over an early dinner. Afterwards, Markus will provide a short introduction to the project and our team’s goals for the rest of the week. Then, as darkness begins to fall, we’ll drive out for our first night’s initiation: a short owl call walk to start familiarizing ourselves with the sounds of forest owls. We’ll return to our house for the night and rest up for the active, hands-on days ahead. Enjoy breakfast at the house and pack a bag lunch for our upcoming day in the mountains. We’ll drive out near the town of Mantua, Utah, where we’ll check for active nest sites in the aspen forest. We’ll hike along trails and through thick vegetation to several nest sites, stopping for lunch in the forest. While out in the field, we’ll aid Markus and his assistant in collecting scientific data on incubating female Flammulated Owls. After a full and very active day in the field, we’ll enjoy a relaxed dinner at a local restaurant in Brigham City before returning to our accommodations in downtown Ogden for the evening. After a good and well-deserved night’s sleep, ease into the morning at your own pace and amble by the kitchen for some homemade brunch. Afterwards, we’ll prepare dinners for the road—or in this case, the forest. Around midday, we’ll head to a more remote study location in Halfway Canyon to check more nests for breeding activity (one-hour drive). 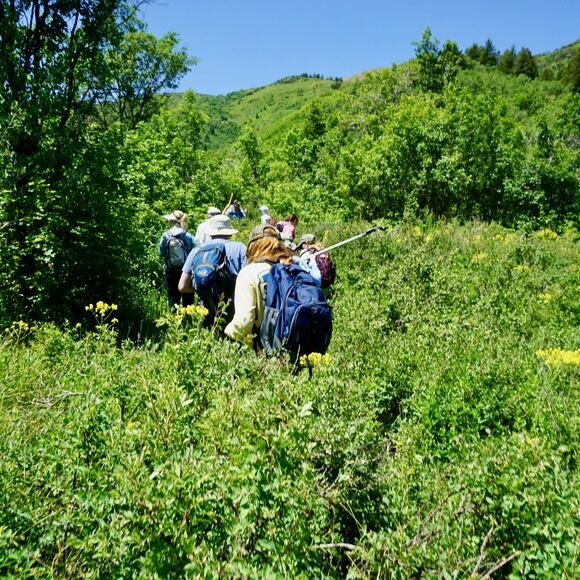 During the short hike to the nest locations, we can enjoy the diversity of butterflies often seen in this area in June and later, learn how to deploy insect traps to measure habitat quality near active nest sites. Once night falls, we’ll call for territorial males with the help of an MP3 player and speaker. Male owls respond to the playback of their call by moving closer, often flying right overhead in an effort to intimidate. We’ll potentially try to trap one in a mist net (up to 12 by five meters in size)—a method used by experienced ornithologists to trap a variety of avian species. Keep in mind that it will be a late bedtime after returning from our nighttime work in the forest. 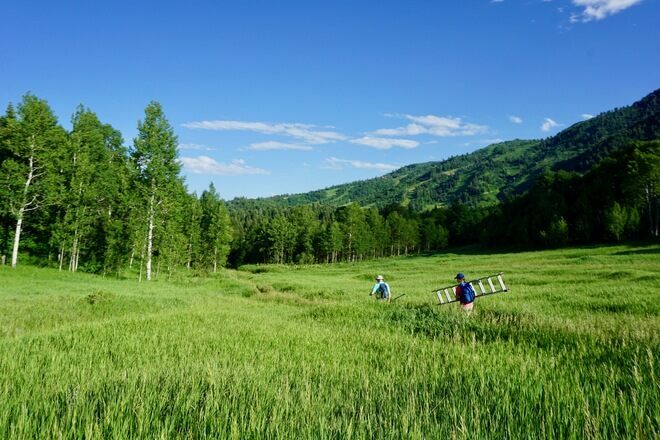 On our last survey day, we’ll set out after breakfast for the woods near Snowbasin Resort. In addition to hosting the Downhill and Super Giant Slalom events during the 2002 Salt Lake City Winter Olympics, Snowbasin has been a key location for owl research. Markus will talk about the history of the area, and we'll spend the morning around Maple Campground checking on active nest sites. Afterwards, sit back and enjoy the beautiful scenery with a scrumptious bag lunch at the campground picnic area. In the afternoon, we'll help deploy insect traps at select locations. These traps are a critical component in measuring habitat quality near active nest sites. On our last evening, we’ll share a celebratory dinner at a local restaurant in Huntsville, Utah—and maybe even grab a beer at Utah’s oldest watering hole, the Shooting Star Saloon. Before bed, we’ll go out on a final night survey to call for territorial males. We might potentially trap them in a mist net set up at Maple Campground. Then it's back to Ogden for our last overnight. Today, we’ll pack up, eat breakfast, and depart from Ogden back to Salt Lake City Airport. If you arrived in your own vehicle, this is where we bid you adieu. For those of us headed to the airport, we’ll be arriving by 10 a.m. You should plan your flights accordingly, though we’re happy to depart Ogden slightly earlier in the morning or arrange for private transport. Until the next adventure! An awesome, unique outdoor experience with hiking and OWLS! This tour will be physically demanding. Participants should be able to hike between 5 to 10 miles per day, often on steep trails and in unmarked sections of the forest, and sometimes involving bushwhacking and the carrying of field equipment, such as ladders. You'll need sturdy hiking boots as well as protective clothing to prevent cuts and scratches to your arms and legs. We will also be spending extended time in the forest after dark with headlamps and flashlights. For the four nights of the trip, our group stays in a spacious house located in downtown historic Ogden with shared bathrooms, a large communal kitchen, and various lounge areas. The house also features a large backyard with tables, a deck, and an outdoor hot tub. Depending on the composition of the group, single travelers should be prepared to share a room with another traveler of the same gender. If flying by air, travelers should book flights arriving at Salt Lake City Airport anytime before 4 p.m. on Wednesday, July 17 and departing after 11:30 a.m. on July 21. If you'll be driving to Ogden, you should plan to arrive by 5 p.m. on July 17 and leave after breakfast on July 21. The total cost of this trip is $1,655. A $500 deposit is required to hold your space. The deposit is non-refundable after three days. The final payment of $1,155 will be due by April 30, 2019. All reservations will be final after this date and subject to our cancellation policy. By submitting your deposit, you agree to the trip's Terms & Conditions. Daily breakfast, daily lunch, and three dinners. The company of an expert avian biologist and research assistant. Private van transport throughout the trip. In offering this trip, does Atlas Obscura support owl research? Yes—and it's an important aspect of the trip for us! We are dedicated to supporting owls and their habitat, and will be donating ten percent of trip proceeds to additional research through our friends at HawkWatch International. In 2018, we were able to make a research donation of $1,436, which will go directly into further study of the flammulated owl. Does tracking the owls cause them any harm or distress? More specifically, how is information collected without disturbing nesting females during such a critical stage? That's a very good question. There is no way of completely avoiding any disturbance on the birds when taking measurements for research. However, Markus keeps the stress to a minimum, firstly by avoiding the handling of the females during at least the first week after they establish their nests (which they do by laying eggs). After the initial first week, females appear to be quite committed to raising their young and the approach of trapping them in the box and returning them safely to the same location is not very intrusive. The birds realize that they are back on their eggs or later in the season with their young and since they usually don’t escape after the handling, it doesn’t cost them much extra energy. In addition, this work is approved by federal and state biologists who check Markus' study design and make sure it is within the accepted levels of intrusion at a nest site. Will I actually get to hold a tiny owl? Yes—under the close supervision of Markus and his research assistant. 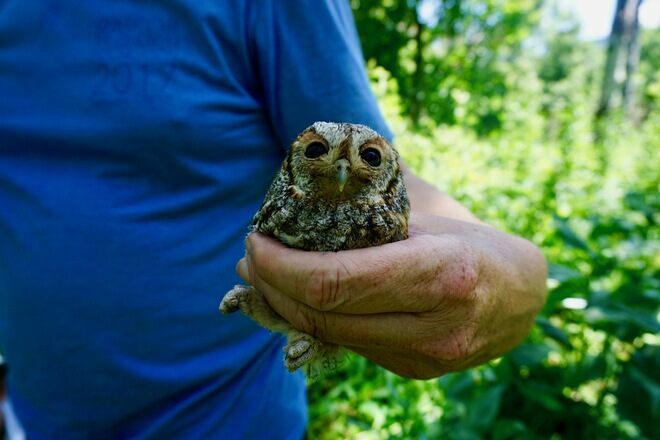 You'll find that staring into the deep, dark eyes of a tiny flammulated owl is a very unique experience. It's incredible what these creatures manage to achieve, flying thousands of miles south each year and returning to Utah in the summer, often to the same exact nest boxes.